When doctors and nurses make mistakes during the labor and delivery process, the consequences can be tragic for the child and family. Our Chicago birth injury attorneys are committed to holding hospitals and medical professionals accountable to allow families to recover the compensation needed to care for their child’s birth injuries. Rosenfeld Injury Lawyers has successfully litigated birth injury cases, including labor and delivery negligence cases, across Illinois and the Midwest. In one case, our law firm recovered $6.14 million for a child who developed cerebral palsy after the OB-GYN failed to perform a cesarean section when signs of fetal distress were present. No family should suffer financially if their child’s birth injury was preventable. If you believe that your child’s injury during labor is related to negligence, complete our online intake form for a free review of your case with a birth injury lawyer. The OB-GYN had a duty of care to the mother and her child. The OB-GYN and/or medical staff breached their duty of care owed to the mother and newborn child. The OB-GYN’s and/or medical staff’s breach of care was the proximate cause of injury to the child or mother. The newborn baby or mother has incurred or is likely to incur some type of physical or emotional harm as a result of the doctor’s conduct. Families coping with a situation in which a child was harmed during the birthing process may have a suspicion as to what happened, but rarely know with certainty what transpired in the delivery room and how it impacted their child. Once our law office is retained, we begin the process of gathering the information needed to determine what happened and why. In situations where we’ve determined that negligence was involved, we work toward establishing damages, so a judge or jury can fairly value the case and our clients can receive the birth injury settlements they are owed. While investigating potential birth injury lawsuits, our Chicago law office regularly assembles medical records from prenatal care and delivery; fetal monitoring strips; ultrasounds; laboratory testing; interviews with nurses and physicians; evaluation of the client with a physiatrist and reports regarding their long-term care needs; and reports from economists regarding the present cash value of care required. Anytime an infant is born with a permanent injury or injuries that require ongoing medical care, the situation merits close evaluation. Below are some injuries we see that may be associated with trauma during labor and delivery or medical negligence. Cerebral Palsy: Cerebral palsy (CP) is frequently manifested when a child loses their ability to control their muscles. 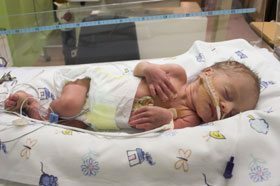 According to the CDC, the majority of CP cases are attributed to congenital issues, with the balance attributed to complications during labor and delivery when the oxygen supply is interrupted. There is no cure for cerebral palsy. Facial Paralysis: Sometimes referred to as facial nerve palsy, the condition may be caused when a doctor puts pressure on a baby’s face before or during delivery. Most cases of facial nerve palsy involve the lower part of the facial nerve, which controls the muscles around the mouth and sometimes the eyelids. Some of these cases may be permanent, while others may be treated with surgery or speech therapy. Brachial Plexus Injuries: The brachial plexus is a group of nerves that controls movement in the arm, shoulder, elbow, and hand. During labor and delivery, pressure may be put on the area when a doctor attempts to retrieve a child who may be stuck in the birth canal. According to the University of Pittsburgh, injuries to the brachial plexus area are some of the most common types of injuries associated with birth trauma, impacting 0.3 to 2 out of 1,000 births. Some brachial plexus injuries may heal on their own, while more severe injuries involving severed nerves may be permanent. Spinal Cord Injuries: Particularly in difficult deliveries, babies may be put at risk for spinal cord injuries when doctors apply force or use aggressive maneuvers. Symptoms include lifeless limbs. Injury location dictates how or if the injury may be treated. Intracranial Hemorrhage: Commonly referred to as bleeding within the skull, the bleeding may occur within the brain itself or between the surface of the brain and skull. If the bleeding is not quickly identified and treated, the affected area of the brain may have permanent damage. Infants with intracranial hemorrhage may develop motor problems or cerebral palsy. When identified early, doctors may treat the condition with medication or surgery. Bone Fractures: Occurring in approximately 1 out of 1,000 births, these injuries are more common in situations where the doctor attempts to maneuver the child for delivery. The most common types of birth injury fractures are clavicle (45.7%), humerus (20%), femur (14.3%) and depressed skull fracture (11.4%). Depending on the location of the fracture and severity, the bones may be treated with immobilization or surgery. Brain Damage: Oxygen deprivation is the leading cause of infant brain damage, occurring in 4 out of 1,000 full-term births. Even a brief interruption in a baby’s oxygen supply can have drastic consequences such as permanent brain damage or cerebral palsy. Situations where brain damage may occur due to oxygen deprivation include prolonged delivery, the baby getting stuck in the birth canal, umbilical cord complications, or the placenta separating from the uterus. When hospitals properly monitor the labor and delivery process, they should be able to identify these situations and evacuate the baby, likely via cesarean section. Fetal Death: A stillbirth can be devastating to the family. Stillbirths occur in about 1 out of 167 births. While some causes of stillbirth in full-term pregnancies may not be identifiable, some identifiable situations include placenta previa, uterine rupture, or a prolapsed umbilical cord. Maternal Injury or Death: The rate of maternal death during labor and delivery has been increasing over the past decade to approximately 17.8 out of 100,000 deliveries. While some attribute this increase to an increase in the number of unhealthy women giving birth, there are a number of external factors that contribute to these situations, including uncontrolled or undiagnosed bleeding. Our birth injury lawyers have handled many cases in which the child suffers developmental or neurological problems that will accompany them for life. Conditions such as cerebral palsy, Erb’s palsy, spinal cord injuries, and other conditions that require long-term care can place a great deal of stress on the family. Needing to care for a special-needs child usually requires one of the parents to stay at home, and the resulting medical bills can be a source of emotional anguish and bitterness. According to the CDC, birth defects, including birth injuries, cost more than $2.6 billion annually in medical expenses. When the cost of medical care and other therapies is calculated, caring for a child with cerebral palsy or other birth injury can easily climb to seven figures. Illinois recognizes several types of economic and non-economic damages in birth injury cases including past and future medical expenses; past and future assistive care expenses (nursing, home care); therapies (physical therapy, counseling, speech therapy); medical transportation (specialized medical vans); pain and suffering; disability; and wage loss. Below you will find some common questions raised by families after a traumatic labor and delivery. Please click on the questions below to see a response. Should you have additional questions, we encourage you to contact our office. What are the Main Causes of Injuries to Newborns During Labor and Delivery? Doctors and attending staff have the duty to take reasonable measures to ensure patient safety. When they fail to do so, you may hold the negligent party accountable. Our Chicago birth injury lawyers handle cases on behalf of clients whose children have suffered injuries during pregnancy and birth. The following is a list of common birth injury causes frequently involved in birth injury litigation. What is the Difference Between a 'Birth Injury' and 'Birth Defect'? A birth defect is something that you child would have been born with according to DNA or medical predisposition, such as a family medical history. A birth injury, however, is damage that an infant sustains during the birthing process (or just before or just after). While many birth defects are inherited, exposure to medications while pregnant may also contribute. Certain anti-depressant, birth control and narcotic medications have been linked to birth defects such as spina bifida, cleft palate and limb abnormalities. Doctors are required by law to report any disability or abnormality to parents before delivery, so if you were expecting a healthy baby, yet the infant has a disability, this is one indication of a problem. In many instances, failure to properly diagnose health issues leads to birth injuries that could have been prevented. Additionally, the color, health and status of the baby at delivery is generally an indication of whether or not a birth injury occurred, though some birth injuries don’t present until later. How Common are Birth-Related Injuries? Approximately 6 out of every 1,000 children in the United States are born with moderate to severe injuries which can include fractured bones, cerebral palsy and developmental or neurological disorders. Approximately 28,000 newborns are injured during or shortly following birth every year. This equates to over 530 per week or 3 per hour. 20% of infant fatalities are the result of injuries sustained at birth. How Long do I Have to File an Illinois Birth Injury Lawsuit? In situations involving a child harmed during labor and delivery but with no permanent disability, the case must be filed within eight years from the date of the occurrence. If a medical care provider purposely withholds information to conceal an error, the statute of limitations extends to five years from the date that the patient discovers the injury. When a child has a birth injury-related disability, the statute of limitations is paused until two years after the disability has ended. In the case of a brain injury or cerebral palsy, they could theoretically pursue a case at any time during their life. Our Chicago birth injury lawyers work tirelessly to alleviate these complications so that families can return to what matters most. We will investigate all details surrounding your child’s injuries to establish how they occurred and who is responsible. By working with nationally recognized experts in medicine, counseling, and economics, we are able to seek compensation that will aid in the care of your child and family. All of our birth injury cases are handled on a contingency fee basis. There is never a legal fee charged unless we are successful in a recovery for your child. We encourage you to contact Rosenfeld Injury Lawyers LLC today and discuss your legal options with an attorney without any cost or obligation.